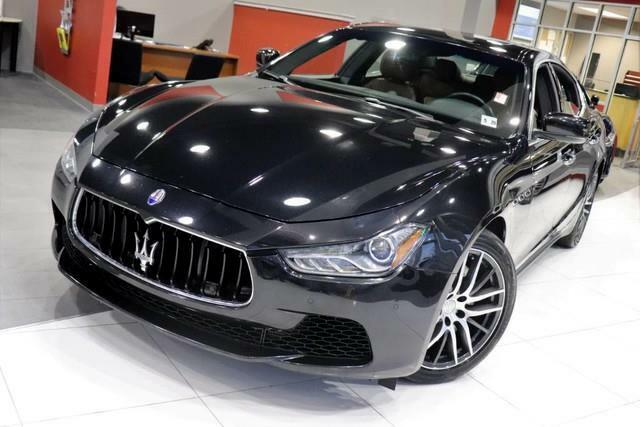 Quality Auto Center is excited to offer this 2015 Maserati Ghibli. This Maserati includes: MARRONE, PREMIUM LEATHER Leather Seats LEATHER COVERED 3-SPOKE STEERING WHEEL Leather Steering Wheel PADDLE SHIFTERS Transmission w/Dual Shift Mode NERO ALCANTARA HEADLINER WHEELS: 19 SPORT PROTEO MACHINED POLISHED ALLOY Aluminum Wheels PREMIUM PACKAGE Keyless Start Variable Speed Intermittent Wipers Remote Engine Start Intermittent Wipers Rear Parking Aid Adjustable Pedals Rain Sensing Wipers *Note - For third party subscriptions or services, please contact the dealer for more information. * You appreciate the finer things in life, the vehicle you drive should not be the exception. Style, performance, sophistication is in a class of its own with this stunning Maserati Ghibli. You'll love the feel of AWD in this 2015 Maserati Ghibli. It provides a perfect balance of handling power and control in virtually every driving condition. With less than 44,104mi on this Maserati Ghibli, you'll appreciate the practically showroom newness of this vehicle. With an efficient and easy to use navigation system, this Maserati Ghibli will help get you from Point A to Point B in no time flat. Intricately stitched leather and ergonomic design seats are among the details in which test drivers say that Maserati Ghibli is in a league of its own More information about the 2015 Maserati Ghibli: The Ghibli is a smaller sedan for Maserati, when compared to their Quattroporte. The Ghibli is their first such entry into a class populated by German and American entries such as the BMW 550i, Mercedes-Benz CLS550, and Cadillac CTS V. The Ghibli is distinctly Italian, however, with an unmistakable profile that recalls its elegant larger sibling, the Quattroporte. Power and handling are ample, particularly in the sure-footed all-wheel-drive Ghibli S Q4 model, while tasteful interior appointments assure that driver and passengers alike travel in luxurious comfort. Strengths of this model include Attractive exterior styling, long list of options, potent V6, athletic handling, available all-wheel-drive, and luxury appointments No Credit / Bad Credit / No Paystubs, No problem !! ! All Approved ! Everyone drives ! CLEAN, GORGEOUS, LOW MILES, SHOWROOM CONDITION. CALL NOW QUALITY CERTIFIED up to 10 YEARS 100,000 MILE WARRANTY , To Certify a vehicle, there will be an additional cost for Certification. CALL NOW For details. STUNNING AGGRESSIVE LOOK ON THIS BEAUTIFUL--Call today to schedule a test drive... Good Credit/Bad Credit/No problem!!!! Get paid cash? No problem!! 100% Credit Approval with interest rates starting at 2.49% for qualified customers, our rates will not be beaten. We price our cars at wholesale price to guarantee the best deals for our customers. Our inventory moves quick, please call to confirm the availability of the vehicle of your interest Springfield location 973-564-0112. This vehicle is located at our SPRINGFIELD location. Come visit our new showroom in Springfield NJ.